While Twitter is great to staying up to the minute on late breaking news and fun to see what people are finding important in their day. Many times we have to scratch our heads when a tweet makes no sense. Most likely, it is because it is part of a conversation that we are just getting started in the middle. Just bringing up that particular person’s latest tweets still only gets us a partial view. 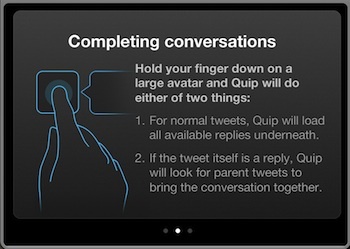 Enter Quip, the iPad app that pulls the conversation together for you… along with a lot more. 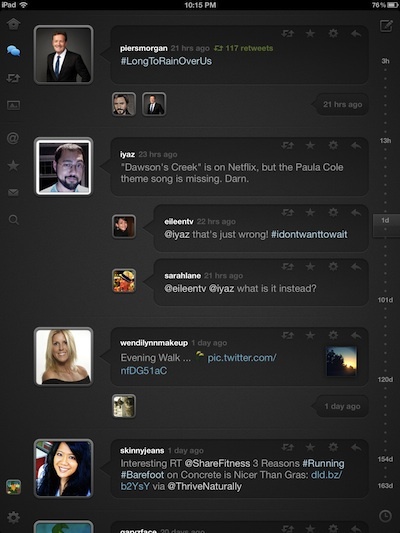 Starting off, Quip looks a lot like many other Twitter apps. 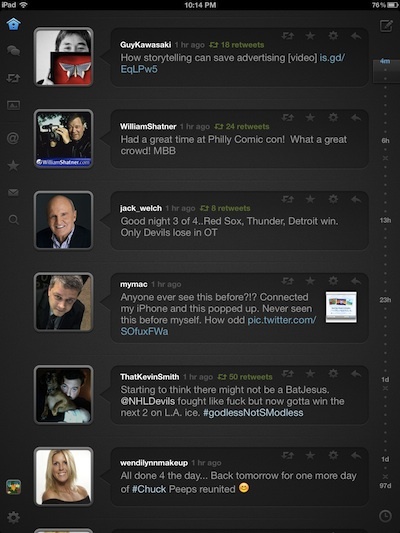 There is the options of what you are viewing down the left and tweets down the center. The timeline overview on the right is nice. Not only does the timeline tell you how far back you are viewing relative to other posts but also you can see how far you are from the newest post… with other apps you have to keep sweeping through the Tweets to see relative time based tweets. Also, the information on the tweet it’s self is nice. Not only do we see if the tweet is a repost, Quip also shows us if and how many times that particular tweet was retweeted. When you come across a post where there is other people commenting on it, Quip shows you the avatars to those people directly beneath the Tweet in the overview. This represents a conversation going on, no more searching! 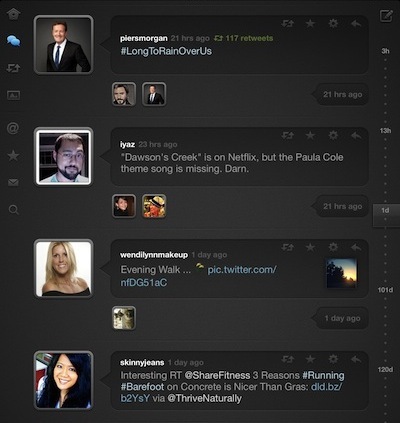 Tap on any of the avatars under a Tweet to have the group expand so you can see everyone’s comments in conversation. Conversation views is only a small part of the many features Quip offers. Throughout the app is hidden functions to enhance your ability to get to the Tweet information your looking for. Below is one where holding your finger/stylus on a person’s avatar will either show you the replies to the Tweet or find the Tweet this post was a reply to. Amongst those many views and features is the ability to get an overview of photos attached to tweets. Notice that you see the same image multiple times if multiple people shared the same photo. 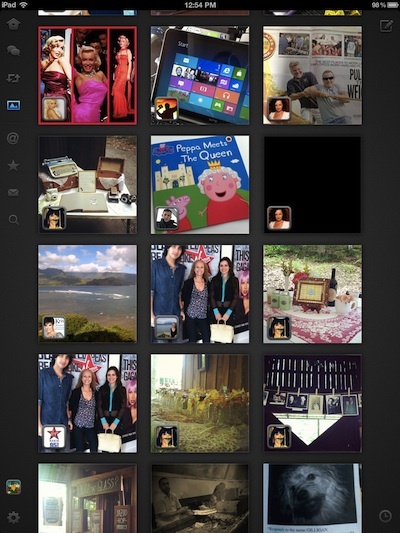 Quip is doing it’s part to keep Twitter in the game of photo sharing like is all the rage with Instagram and Facebook.